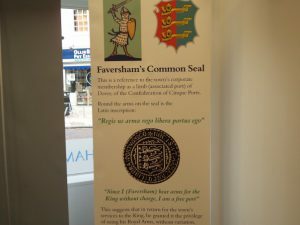 Faversham’s history – attracting a growing audience. On Wednesday evening, the Canterbury Christ Church University bookshop hosted the launch of Michael Jones’ new book on the Black Prince, but before I give a short report on that event, I just want to mention a conference that took place in Chartham last Saturday. Before I come on to the report on the Medieval Pageant, especially the Centre’s contribution in the Greyfriars Garden as part of the Family Trail, I thought I would offer a round-up on news, events involving people from the Centre coming up soon, and its programme of events for the early autumn. I thought I would begin this week by mentioning Dr Michael Jones’ book launch for his new study on the Black Prince. This will take place at the Canterbury Christ Church University bookshop on Wednesday 19 July at 5pm and is free – all welcome.